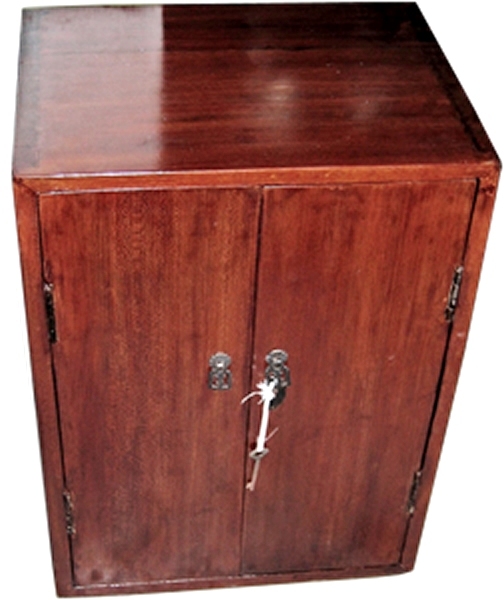 Cantonese stationery cabinet, designed to sit on a desk top. It has beautiful lines and the uncarved surfaces show up the beauty of the wood. It has two doors and brass fixings. Inside are two shelves and a single drawer which is faced with a black and gold lacquer bamboo design. It was made in the mid 19th century. It comes from Guangdong as is made in pine. Unusually it still retains its original European style key.